A kitchen sink is one of the ultimate accessories of any kitchen. Stainless steel single bowl sinks have proven to be the most convenient in terms of durability, elegance and ease-of-maintenance. They have become a top choice for small home remodeling projects owing to their ease-of-installation and affordability. There are hundreds of models for kitchen sinks on the market, but do all these models have what it takes to add some fun to your dish washing tasks? 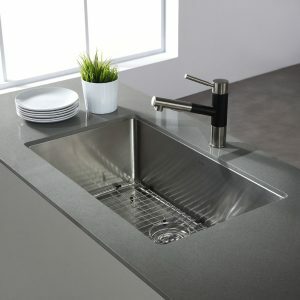 It is for this reason that we have decided to present to you the top 10 best stainless steel single bowl kitchen sinks in 2019. Read more and discover what we have in store for you. This kitchen sink provides the convenience of a drop-in mounting mechanism. It sports a sturdy construction made of 22-gauge stainless steel. This superior quality material enables it to take a beating, especially when subjected to impact. It doesn’t dent easily and can withstand corrosive chemicals to ensure long-lasting use. The sink is infused with a sound shield technology that helps you work in a quiet and relaxed environment. It has a drain hole of 2 inches and built-in rails for hassle-free mounting. The sink comes in a square shape having an overall dimension of 15 x 15 inches. Here is a flexible sink that sports a dual mount installation. You have the option of installing it flush mount or undermount. The sink is made of 304 grade premium quality stainless steel. It is a blend of two materials: chromium and nickel. The combo materials provide a sturdy construction that is absolutely rustproof and more resistant to scratches. A luxurious sating finish comes in handy to add to the decor of your kitchen and provide hassle-free cleaning. The sink generates low noise in the event of impact, thanks to the integrated sound guard padding. It sports a tight radius that adds to its elegance and ease-of-cleaning. 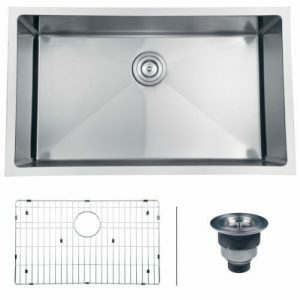 The sink has a 3.5-inch drain and measures 19 x 32 inches. This single bowl kitchen sink is specially designed with durability in mind. The extra-thick material renders it more dent-resistant and resilient to scratches. Noise is kept in check with Stone Guard Coating and rubber pads. The satin finish and rounded corners make cleaning and maintenance task quite a breeze. This non-porous kitchen sink comes with a basket strainer for added convenience. It sports a standard drain measuring 3.5 inches. The sink measures 23 x 17.6 inches. 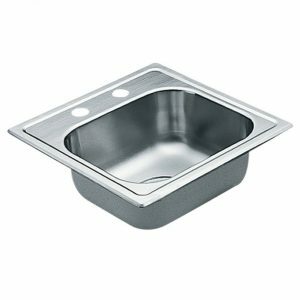 Its extra-deep, 9-inch basin provides a perfect fit for large dishes. This sink comes with a modern look that gives your kitchen a classic look. It has a 16 gauge construction that removes any worry of rusting, corrosion, scratches and dents. Excellent noise dampening is achieved with heavy-duty sound guard padding. The sink provides the convenience of rounded corners that accentuate its modern look and make clean-up a breeze. The bottom has a unique slopped design with a series of grooves that provide complete water drainage. The sink comes with all the mounting hardware for hassle-free installation. It is 10 inches deep and measures 23 x 18 inches. Ruvati RVM4132 makes light task of dish washing. Its premium, 16 gauge stainless steel provides a long-lasting construction. The sink sports a dual-mount design to enable you mount it to your liking. 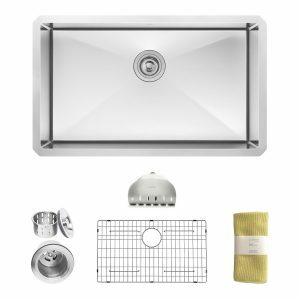 The brushed stainless steel construction is finished in satin and a smooth finish that allows the sink to be easily wiped clean with a damp cloth. Innovative undercoating with integrated padding provide top-notch noise reduction. The sink has a standard drain (3.5 inches) designed to fit any garbage disposal unit. It is 17.2 x 23.4 inches and measures 9 inches deep. Here’s a sink designed to exceed the industrial standards. Its construction pushes durability and sturdiness to a whole new level. It doesn’t dent easily and provides long-term resistance to corrosion and rusting. Your kitchen is sure to be highlighted in its luxurious and elegant satin finish. The satin provides an easy time during cleaning and makes the maintenance task less worrisome. The zero radius at the corners add to its modern look and makes wiping much easier. The sink has specialized padding and an undercoat that minimize noise. 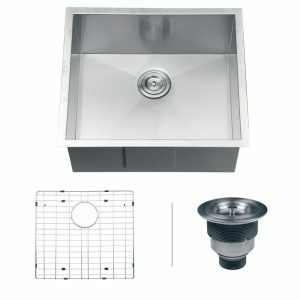 It sports a 3.5-inch drain and measures 21 x 33 inches. 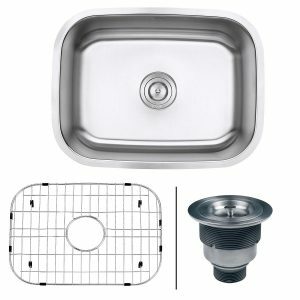 This is the ultimate model in the world of single bowl stainless steel kitchen sink. This sink highlights a perfect balance of elegance and durability. The satin finish upgrades the decor of any kitchen environment and provides easy cleanup. The sink is non-porous and resistant to corrosion which doesn’t scratch easily; Furthermore, it functions well in providing great resistance against stains. Rubber dampening pads and and a specialized sound guard coating minimize any noise. The sink sports the elegance and easy cleanup of rounded corners. 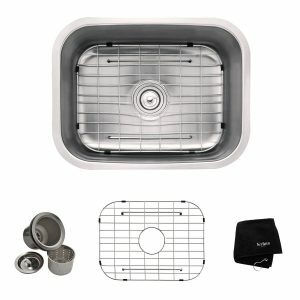 It has a 3.5-inch drain and measures 10 inches deep for extra space. The sink has a dimension of 18.38 x 31.5 inches. 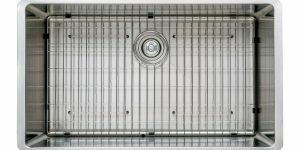 Zuhne kitchen sink is handmade to great precision using 16 gauge stainless steel. The excellent craftsmanship and quality material makes it resilient to scratches, corrosion and rusting. The brushed finish compliments any decor and provides easy cleaning. The sink minimizes damage to cabinets caused by condensation and works well in providing excellent soundproofing. The 10-inch depth provides extra height to accommodate large dishes. The sink measures 18 x 30 inches and fits cabinets measuring a minimum of 32 inches. 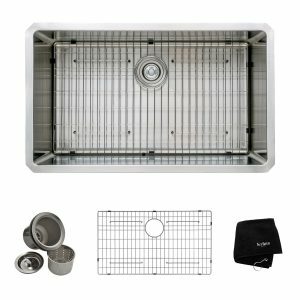 Want some extra usable space for your dish washing tasks? Well, this undermount sink might just performs what you are looking for. This is a sink that is designed to meet and exceed the set industrial standards. 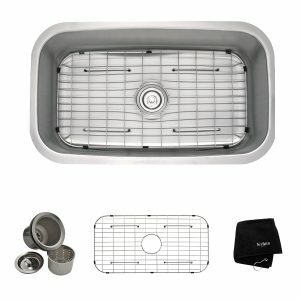 It provides the sturdiness and durability of 16 gauge stainless steel finished in an easy-to-clean satin. With this sink, you are assured a perfect fit for large dishes, thanks to its spacious bowl that sports a rear-positioned drain. The sink is 10 inches deep and measures 18 x 30 inches. It is designed to fit in cabinets measuring a minimum of 33 inches in length. This sink is handcrafted to high quality standards that suit modern kitchen settings. It comes in a heavy-duty construction of 16G stainless steel. The sink has a NoiseDefend Technology for excellent soundproofing. The extra-thick material provides maximum protection from scratches and daily wear. At 10 inches deep, the sink provides sufficient depth to accommodate large dishes without any splash. 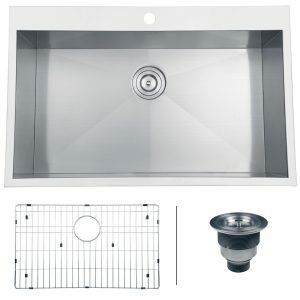 Its standard drain is positioned at the rear to provide plenty of room that maximizes the usable space. This kitchen sink measures 32 x 19 inches. These are the 10 best stainless steel single bowl kitchen sinks in 2019. They edge out all other competitors by sporting the most when it comes to style, durability and functionality. These sinks come at affordable prices that won’t cost you a fortune. Make up your mind and select the model that will make a nice addition to your kitchen.